In the wake of what seems to be an unending spread of global radicalization, whether it takes the form of race riots in Charlottesville, U.S.A., or a terrorist attack in Spain, a film about a military force laying siege to a Brooklyn neighborhood as Texas and other states secede from the U.S. seems less like a dystopian fiction than it does a frightening plausibility. 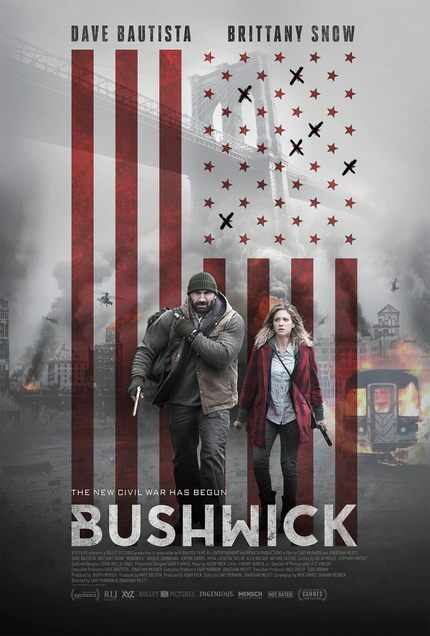 When the film had its world premiere at Sundance early this year, ScreenAnarchy’s Jason Gorber called Bushwick “A Provocative and Chilling Picture of America in Crisis”. Suffice it to say, recent developments have not made the statement any less true. Other than for its almost painful topicality, however, Cary Murnion and Jonathan Milott’s Bushwick also emerges as something of a must-see for the technical craft on display. Last week I had the opportunity of talking with Bushwick’s talented directors. Read on for the full interview below. ScreenAnarchy: In 2014 you burst on the scene with COOTIES. The ending of your debut feature sees our intrepid band of teachers facing nationwide catastrophe and possible doom. Your latest film opens with Brittany Snow and her boyfriend arriving in Bushwick, Brooklyn, and pretty much instantly all hell breaks loose. What is it with you guys and apocalyptic narratives? Cary Murnion: I know, sheesh! That’s very true and I think that, in a good way, both movies have a little bit of a through line in that the monster in Cooties – these hordes of zombies that are attacking our main characters – are similar to the way nationalists are going to invade New York [in Bushwick]. We do like to see how normal people react to extreme situations and how people can both rise up to that and also fail at that. I think that makes for great drama in movies, and in our first film there’s definitely a mix of comedy with that drama whereas our new film is a very tense and dramatic experience, despite a few comedic moments. In a way the first movie, Cooties, was officially a horror movie but … I don’t know how much you’ve been following the news in America, but right now Bushwick is seeming more and more like a horror movie. COOTIES navigated the tightrope between comedy and horror, but BUSHWICK is indeed a much bleaker film. It is an action-adventure with plenty of instant thrills, but this struck me as the opposite of an exercise in escapism. What inspired the story and how aware were you of the growing racial divide in America? Yeah, this film is inspired by a quote by the former governor of Texas, Rick Perry, back in 2006, where he made ‘a joke’ about what would happen if Texas seceded from the United States and that was when Obama was in office as a senator. So we took that quote and played it out to see what would happen if that were to transpire. So for us, all the stuff that’s going on in America now has been bubbling beneath the surface for years. And not only in America for that matter. We see lots of discontent and people who are divided across the whole world. Especially now in Europe; we’ve seen it just yesterday [17 August] with that horrible attack in Spain, but also in Paris, Brussels … so this is something that we’ve been thinking about a lot; to have the chance to create a movie that touches upon those feelings, and it’s something we feel very proud of, to be able to take part in that dialogue. But we also hope the movie is fun, that you can watch it and not be hit over the head with messages. Obviously the premise is there, but that you’re going to see it from this point of view of a regular girl coming home from college and how she can’t get home. I think we just hope that there’s a chance to escape a little bit from what’s going on in the world today because it’s pretty scary. Would you say your film functions as a critique on the dangers of radicalization and do you feel that perhaps BUSHWICK can help promote the value of a multicultural society? We hope that this movie is a cautionary tale. We hope you watch this and you don’t want to come out of it thinking ‘Oh I wanna take a gun and start shooting people who I don’t agree with’. We hope you see that’s not the answer; that there’s a much better chance for de-escalating things if you protest, but in a peaceful way. Whether you’re right or wrong, if you take up weapons and start to take your anger out on other people there’s a pretty good chance that you’ll either be hurt or killed. That’s how we view the film at least: as a cautionary tale. But it also plays into how we filmed this, with the long takes. We feel that they don’t glamorize or glorify the violence, and also the way in which we conclude the film with the fate of our protagonists …. What actually ends up happening to some of our heroes also illustrates our anti-violent viewpoint. You just brought up the most striking stylistic element of BUSHWICK: the fact that the film consists of a string of long takes which help generate a state of constant apprehension and edge-of-your seat tension. What were some of your inspirations for these action-packed long takes and how much time was spent rehearsing those sequences? That scene from True Detective is one of the best action sequences we’ve ever seen; that along with Children of Men, which has been a big influence on us. Not just for its use of long takes but for taking a pretty far-out theme – a time in our country when there’re no babies being born – and make it feel like it actually could happen. That sensation derives from how the director and cinematographer film Children of Men. For us, Cuarón’s movie was also an inspiration in that sense: taking this far-out idea and making it feel grounded. The long takes help to immerse the audience in this world. We’ve always liked this idea of kind of putting you in the shoes of the character. In Bushwick, Lucy [Brittany Snow] tries to reach home, which is only three blocks away, and you think ‘well, that’s kind of easy. She can make it to her grandmother’s house. Three blocks is not a big deal’ but you are with her the whole time and you see and feel what happens to her; how hard it is. Around every single corner there’s something dangerous lurking, or roadblocks crossing her path … Those long takes help make you feel like you’re right there. We had originally thought of doing Bushwick as a one-shot film but realized we would’ve had to make a lot of compromises to actually execute an action movie in one solid take. We lucked out in terms of new technology just becoming available, literally a month before we started shooting … This allowed us to do things we don’t think any film had done before and we haven’t really seen it since. We really got to put the camera in places that we couldn’t do with a normal Steadicam or normal-sized camera body. We spent months planning this out. John and I spent months in the neighborhood, walking around and checking where we wanted to film it, hoping we could get these locations for the movie … We had a week and a half of rehearsals with the actors and some of the crew, so we really had a chance to meticulously plan out how we make this story feel real and lived-in with long takes but also to avoid that the audience felt like they’re stuck walking five blocks; that’s not fun to watch. This is what happened with the long take film, Victoria. I love that film, but I think some of the technique overtakes some of the story. They stick with their technique wherever they are so there’s a lot of the audience seeing people return back to where they came from or entering buildings. I think a lot of that is intentional but we didn’t want to have the technique overpower the story and the momentum of the film. Another element that really stood out to me is how you use religious imagery throughout the film. Whether it’s a crucifix on the wall, a necklace around Brittany Snow’s neck, a Maria statue in the background as the protagonists are heading for a school rooftop, or a church and its basement towards the end of the film: Catholicism is heavily represented. I was wondering if you could elaborate on its importance. That is typical of the neighborhood. There’s a lot of churches, big and small, and we wanted to reflect that in the people who live there. We also wanted to use the imagery but at the same time subvert it. When the characters actually go into a church there’s some things taking place that are not what you would typically expect to happen … There’s belief and nonbelief happening in our movie. We wanted to kind of show both sides to that. I think a lot of movies use religion as a way to give the characters something that they believe inspires them and I think for us it was showing that that doesn’t help them. That is the main thing we were trying to convey with flipping it on its head but we also think it’s an interesting aspect to American politics where the far right is usually considered the more Catholic-based and that’s usually what drives them and their ideology. So to have the neighborhood that they’re invading have all this religious imagery, to us, is just another aspect of flipping what you’d take for granted on its head. As a little side note, my dad used to be a priest and my mom used to be a nun. They met in church, fell in love and left the church, and had me. So there’s an interesting history with religion in my family, both the good and the bad. The film opens in select U.S. theaters and On Demand platforms on Friday, August 25. AnarchyVision: Cannes 2017, Netflix and More!